Credit card fraud regularly results in huge financial losses and a host of ever-evolving threats to consumers. And among the wide range of attacks involving this type of fraud, one in particular has risen rapidly in recent years to pose a costly threat – false declines, also called false positives. These are valid transactions that are attempted but incorrectly rejected, and ones that can have major unintended consequences for e-commerce merchants’ fraud-prevention strategies. In fact, according to Business Insider, in 2016, it was estimated that U.S. merchants would lose $8.6 billion in falsely declined transactions. This would eclipse the $6.5 billion in prevented fraud that merchants expected to prevent, making false declines a serious threat that must be reduced in order for merchants’ fraud-prevention strategies to be cost-effective. Fortunately, however, one defense that offers a crucial tool in a fraud-prevention strategy for credit card fraud lies in our mobile devices. Because we keep our mobile devices within reach almost all the time, these devices play an important channel through which we can be immediately and reliably notified. As one example, we open 98 percent of text messages that we receive. In this area, Syniverse has been working closely with mobile operators and card issuers to integrate real-time fraud-alerts into the card-authorization process. As part of this, we recently rolled out a solution developed for the 2015 Telephone Consumer Protection Act updates that addresses a change that many financial companies have not taken advantage of. Specifically, the FCC allows opt-in exemptions for certain fraud-related use cases. As a result, U.S. financial companies now have the flexibility to notify customers of suspected fraud or identity theft risks through free calls or text messages, without having to obtain customers’ prior express consent. A new case study we’ve just published, “Financial Fraud Alerts: No Opt-In Required,” describes our solution related to this change. In particular, the case study illustrates the power of a real-time, two-way transaction verification program to better protect the customers of a large bank. 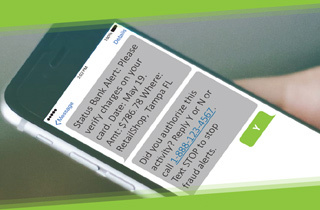 Using intelligent mobile messaging, Syniverse implemented a real-time fraud-alert program that enables account holders to validate ATM and payment card transactions through two-way text messaging. This program allows the bank to limit fraudulent transactions as well as reduce false declines. I invite you to download the case study below or visit our Financial Services page to find out more. With over 30 years in devising mobile solutions, we at Syniverse look forward to using our experience to help us better protect financial services companies against today’s ever-rising fraud attacks.